Update: now with ISO sensitivity test images. Ever since Panasonic launched the first mirrorless compact system camera in September 2008, there has been rumour and speculation about whether Canon and Nikon would follow suit. But we had to wait, a little over three years before Nikon revealed its hand and unveiled two cameras, the Nikon 1 J1 and the Nikon 1 V1. Collectively these make up the Nikon 1 system, and they both have the same 10.1MP CMOS sensor. 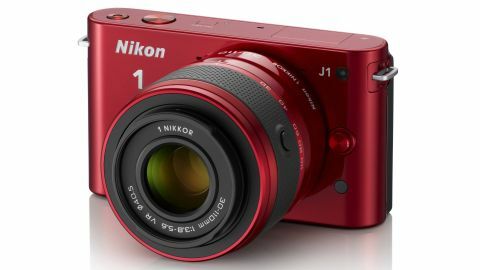 The J1 is the entry-level model, with the biggest differences between it and the V1 being the lack of an electronic viewfinder (EVF) and a lower resolution LCD screen. The Nikon J1 does, however, have a built-in flash, whereas the V1 doesn't - instead extra illumination must be provided by the new SpeedLight SB-N5, which has a novel shoe-mount. With a street price of around £375 ($497 in the US) for a kit that includes the 1 Nikkor 10-30mm f/3.5-5.6 VR lens, the J1 is set to be the more popular of the two cameras - the V1 10-30mm kit retails for around £620 ($745). As well as introducing the first new Nikon lens mount since 1959, the Nikon 1 cameras also debut a new sensor size that has been dubbed CX format and measures 13.2 x 8.8mm. This is smaller than both APS-C and Four Thirds format, and means that mounted lenses have a 2.7x focal length magnification factor. It also means that the new cameras are slightly handicapped from the outset, because larger sensors mean more room for larger photoreceptors, and larger receptors usually result in better image quality. However, Nikon hasn't exactly pushed the boundaries of sensor resolution, and has kept the effective pixel count at just 10.1 million. Until recently, Nikon was adamant that 12MP was enough for its APS-C format and full-frame cameras, provided the images are clean and of high quality, so the arguments are familiar for Nikon 1. More big news for Nikon 1 is that the two cameras have a hybrid autofocus system that uses phase and contrast detection. Unlike DSLRs that use a dedicated AF sensor, the J1 and V1 use 73 pixels on the imaging sensor as phase detection AF sensors. Interestingly, although these pixels have a role to play in auto focusing, they are still used to make up the image. Nikon employs both phase and contrast detection, because although current phase detection AF systems are faster, contrast detection is generally more accurate. While the V1 has both an electronic and mechanical shutter (and the user can select which to use), the J1 just has an electronic shutter. Using an electronic shutter enables the continuous shooting rate to be pushed as high as 60fps, with 30fps and 10fps options also being available. Full HD (1920 x 1080) video recording is possible at 60i, 30p (29.97fps) or 60p (59.94fps). In addition, slow motion video can also be recorded at 640 x 240 at 400fps or 320 x 120 at 1200fps, both of which are played back at 29.97fps. In Motion Snapshot mode, the camera shoots a snippet of full HD video footage at 69.94fps for replay at 23.976fps (making it around one second long), with accompanying music and ending with a still image. Footage is recorded to the buffer memory from the moment the shutter release button is half-pressed, so the video includes slow-motion action from the point immediately before the shutter release is pressed home. While Nikon is aiming the J1 at family photographers who are likely to rely on automatic exposure modes, it also has the program, aperture priority, shutter priority and manual (PASM) exposure modes that are preferred by enthusiast photographers.